The Imperial Defence Act of 1888 had allotted £3 million to construct additional fortifications at the naval and mercantile ports throughout the Empire and this had enabled the re-arming of many of the existing works. 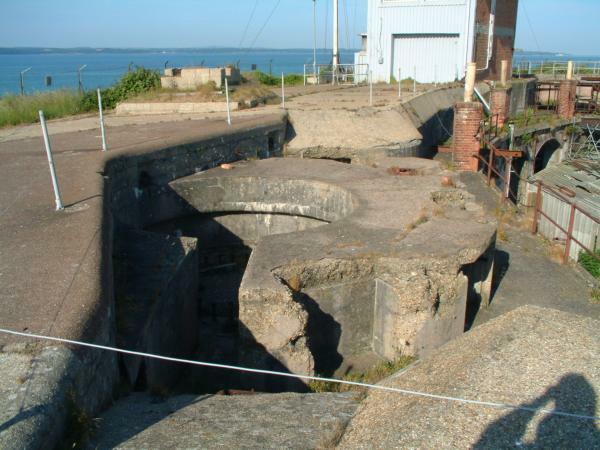 Browndown Battery at Stokes Bay received a new lease of life with two 12.5 inch R.M.L. guns. At Gilkicker it was impossible to re-arm with the latest guns because of the restrictive nature of the casemates. On 9th. 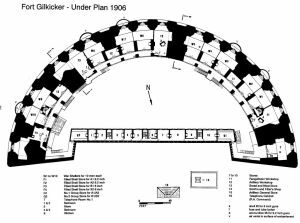 November 1891 the General Officer Commanding Portsmouth, having called attention to the unsatisfactory position of two of the 3 - 11 inch R.M.L.s on the roof at Gilkicker proposed that they be removed and mounted in a new battery near Fort Monckton. 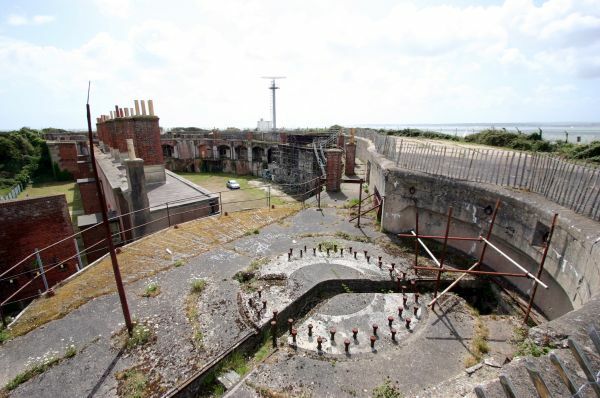 The Works Committee recommended that they were no longer needed, as Browndown Battery had been completed and Puckpool Battery on the Isle of Wight, strengthened, and should not be allotted to any new site at present. 2 x 9.2-inch B.L. Mark X on barbette V mounting. 2 x 6-inch B.L. Mark VII on Centre Pivot II mounting. These were to be placed on the roof. In 1904 Gilkicker also had two machine guns on parapet mountings. The reconstruction began in 1902 and was complete by 26th October 1906. The estimated cost was £16,600 and the actual cost was £19,671. The contractor was W.Hill. 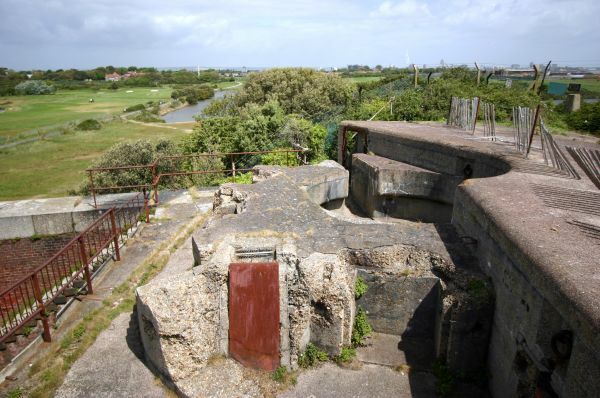 The cost included the rebuilding of the magazines, gun emplacements and barracks. An Artillery General Store and a Fitter‘s and Blacksmith‘s shop were built to the rear of the fort. 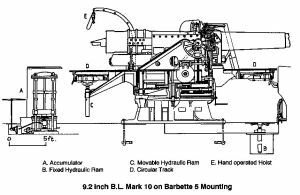 The magazines were altered to accommodate 1000 6inch BL shells and 2000 cartridges and 500 9.2 inch BL shells and 1000 cartridges. The exact date that that earth was piled up against the granite face of Fort Gilkicker is not known. A water colour in Portsmouth City Museum labelled 'Sham Attack Stokes Bay' and dated 1904 shows the fort without the earth. It is possible that the earth was piled up in stages probably from the time that the ditch was filled in during the strengthening of the magazines in the 1880s. The reconstruction of 1902 to 1906 is the most likely time that the earth embankment was added. Only the ends of the granite wall are now visible. A Gosport resident of the early 1900s suggested that the weight of the guns cracked the wall and that this was the reason for the earth covering. 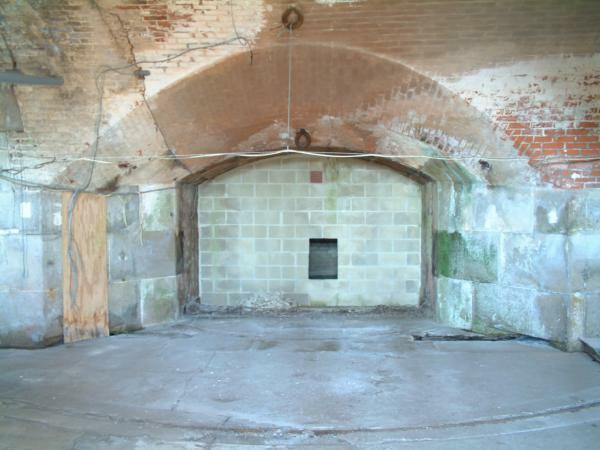 Recent surveys have found that there are numerous cracks through the brick casemates and granite facing, one of which extends right through the fort from top to basement. Concrete pads placed to detect movement date these cracks to no later than 1906. 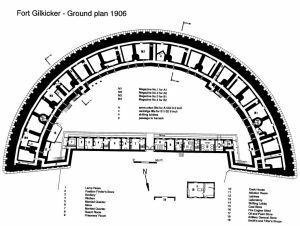 Plans of the fort reveal however that by this time the casemates had been drastically altered. Casemates 3. 11, 16 and 21 were extended to allow ammunition lifts to be fitted to supply the roof guns. These casemates served as filled shell stores. Their rear partitions were removed and a new brick one built so that part of the veranda was enclosed. Doors were fitted accordingly to provide a continuous walk-way along the rear of the casemates, as before the alterations, interrupted only by the filled in casemates. Six of the embrasures had by this time been filled in completely as part of the strengthening programme. Five embrasures and their shields were protected by a semi-circular wall which appears to have been to provide ventilation shafts to the top of the bank. In 1970, fourteen of the remaining shields were sold as scrap. Breeze blocks were put in their place. The two end shields were left in place and are the only ones now surviving. 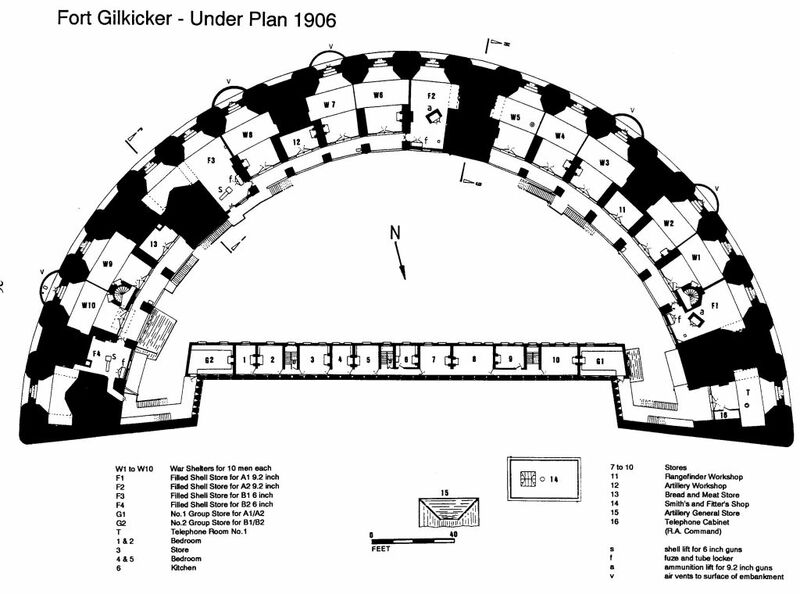 Plan of the altered ammunition magazines 1906. Sir George Clarke, Superintendent of the Royal Carriage Department, later Lord Sydenham, recommended in a book on fortification published in 1907, that his new design of guns be deployed in pairs of similar natures forming a group for 'purposes of command in action'. This had already been accepted. Browndown Battery with Number Two Battery at Stokes Bay was equipped with complimentary guns to form such a pair with Gilkicker. On the roof at Gilkicker the two right hand guns were 9.2 inch 28 ton Breech Loading, designated A1 and A2. They were supplied with shells via an ammunition lift from the filled shell stores on the old gun floor below. 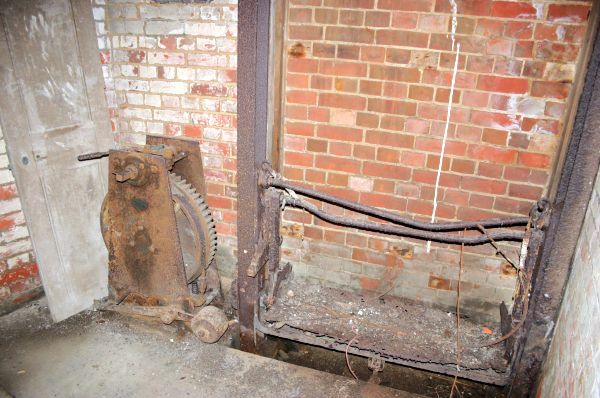 The winch for the lift was on the basement level as the lift served for both shell and cartridges. Two of the basement stores were modified as cartridge stores. Each cartridge store had an issue hatch with lamp recesses above so that the cartridges could be issued directly out to the old shell passage. The labelling 'issue hatch A1‘ is still readable. A short distance away the passage was widened to accommodate the winch and lift. This 9.2inch B.L. at Frenchman's Point is the same Mark X on and MarkV mounting that was at Fort Gilkicker and Browndown Battery. The two left hand guns were for the 6 inch B.L. guns. These were supplied with shells via a shell lift in the filled shell stores below on the old gun floor. One of these is still in place. 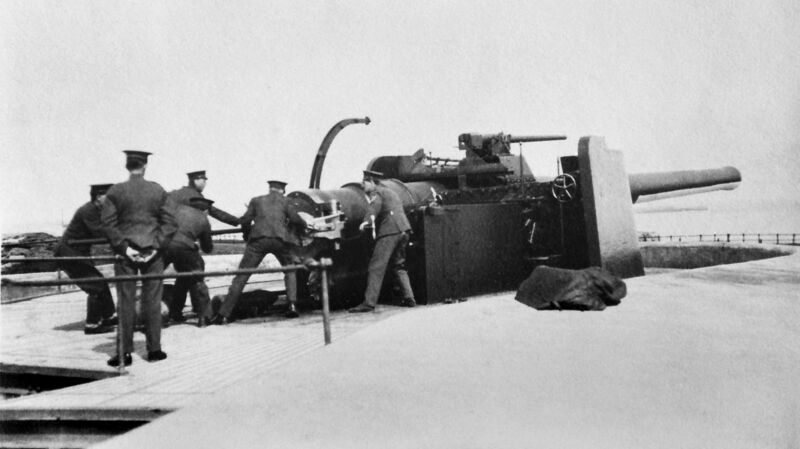 Unlike the 9.2 inch guns the 6 inch guns had a separate lift for the cartridges. Two basement magazines were altered to cartridge stores and each had an issue hatch into a lobby from which a cartridge lift ran up to the gun. Access to the four magazines was from the old powder passage which was connected to the old shell passage by four cross passages These also served as shifting lobbies. 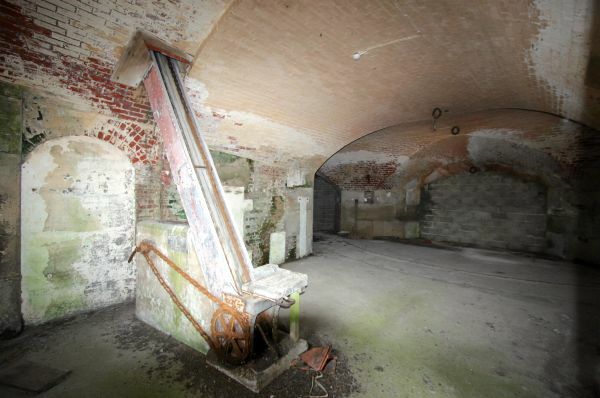 The old shell lifts for the earlier gun floor were blocked off at basement level and their openings onto the gun floor above were filled as part of the modifications to the veranda and casemates. In one case where the lift emerged in the floor of casemate 5, the only one to have this arrangement, the lifting ring can be seen in the wall of the casemate. All of the other shell lifts emerged within the piers and no traces are left. The powder lifts were left intact, possibly to serve as additional lamp hatches. Their lifting rings, hatch covers and speaking tubes are still visible today. Ten of the casemates on the gun floor also served as war shelters, each one for ten men. Casemate number 1 became a telephone room. The unfilled section of casemate number 6 became a range finder workshop, that of number 14 became an artillery store and number 18 became a bread and meat store. 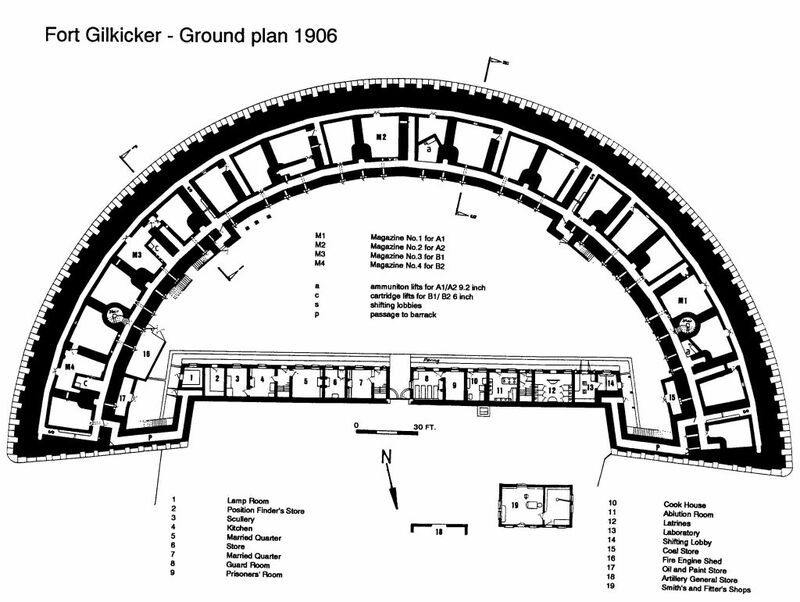 Plan of the altered gun casemates 1906. The guns at Fort Gilkicker were declared superfluous by the Owen Committee in 1905. The guns were removed in 1906 and the fort no longer served as an active part of the defences of Portsmouth harbour. It continued in military use as accommodation for the Royal Engineers who were stationed nearby at the School of Electric Lighting. It saw a brief revival of use during World War Two when it was used during the D-Day landings as a signal station and message forwarding facility. It was finally put into care and maintenance in 1956.